...we will be on a round of family visits. A very cheery evening this week with the Catholic Writers' Guild, with Medieval music by Dr Mary Remnant - she called for volunteers to help with various musical instruments and Jamie cheerily obliged, making a glad sound with a set of chiming bells...it all rounded off a successful year for the Guild, which holds its AGM in January on the feast of St Francis de Sales, our Patron. to Bishop Luffa School to present certificates of Merit and Special Merit gained by pupils in the 2007 Schools Bible Project. I was given a lovely welcome, and hugely enjoyed joining in the morning Assembly - "O come all ye faithful" and a presentation by a group of children on the theme of giving at Christmas...these days, when pupils take part in a school assembly in this way, they skilfully use videos they have made, power-point displays, etc... Later I met some delightful VI formers and visited a busy RE class - everywhere I went in the school, people were friendly and cheerful, the pupils looked extremely nice in their maroon uniforms, and there was a sense of bustle which was very enjoyable. Things had started on a happy note even earlier. I had stayed overnight at a local hotel, as the school Assembly was at 8am. By 7.45 the taxi hadn't arrived, and I was getting anxious - and a delightful lady member of the hotel team said not to worry, her car was just outside - she'd take me...now that's the kind of thing that restores one's faith in human kindness...she was so nice, and we chatted happily on the way... her children, now grown-up had been pupils at the school...this kindly help gave a glow to the day. Later, a walk through a city just tinged with frost, and into the glorious Cathedral, which was warm and welcoming, with a most beautiful crib scene at the entrance (Mary's arms cradled, ready - but the Baby not yet there, and clearly to be added at Midnight on Christmas Eve...). A school group was practising Christmas music, great arches soared above, and one could light a candle at the tomb of St Richard, now restored after 16th-century despoilations.. There is an excellent display telling something of the Cathedral's story, highlighting St Richard, and other characters from down the years including the famous Bishop Bell. I dropped into the Cathedral shop - through glorious cloisters - where there are lots of lovely rather Auntie-ish things, books and lavender things and stacks of jars and nicely packaged goodies...I was rather sorry when I had to leave and get back to London. ...are occupying quite a bit of my time at present, so blogging may be thin for a couple of days. Among other things, Jamie has a dreadful cold. I was meant to be carol-singing this evening but that fell through...and it's just as well as J. is feeling bleak, and it's time for domesticity. We have enjoyed some Jane Austen and hot drinks, and the Advent wreath with its three candles, and the house feels cosy. ...new book just out from Family Publications. 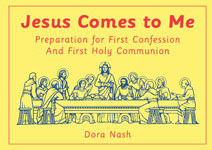 It's by Dora Nash, Head of RE, mother of four, and it's for children preparing for First Communion and it's really excellent. Order it from Family Publications here. Dora Nash is my sister-in-law. Her book on Confirmation has already proved its worth and been popular with lots of parishes, families, and youth groups, and we've all been waiting for one on First Communion. This new book is beautifully presented, with lovely illustrations, all the information from Scriptures to explain about Confession and Holy Communion, prayers to learn by heart, quizzes, word-searches, even a cut-out priest to dress in different vestments! It tackles everything, from how to go to confession through to words and phrases to study and understand...all in a bright, easy-to-read style with clear print and a fresh feel. It's exactly what a Catholic child needs and will be of use in every parish - even for children unfamiliar with all sorts of basic concepts for whom First Communion is perhaps the first real contact with systematic Christian teaching...very, very highly recommended. ...are one of the best things about Christmas. Every year a group meets to sing at London's Victoria and Waterloo stations, organised by the excellent Yvonne W. through St Joseph's parish, Roehampton, with volunteers from the pro-life movement and Yvonne's friends and contacts... This year the parish priest, Fr David, came along too and as he has a fine voice, and we also had a violinist and a guitarist, we really did made a gladsome sound...Yvonne gave me a red Santa Claus hat and I took up my usual position as conductor in front: just waving my arms about to keep the group together and keep time...it's all hugely enjoyable, and the glorious songs rang through the station, and we raised lots and lots of money and there was a great deal of enthusiasm. We'll be at Waterloo station next Friday, Dec 21st, from 5pm to 7pm. Come along and join us! ...doesn't seem very Christmassy. There is a feature about this in today's Daily Telegraph. It misses the point, of course - the reason for the un-merry mood is not an incipient recession and people not spending enough in the shops (goodness know, there will still be a glut of rubbish bought and sold this Christmas), and it's not even the now-ritual debates about local authorities bowing to secularist pressure and refusing Christmas decorations on the grounds not "not offending minorities" etc etc. It's not even the daft healthnsafety regulations which have ensured the banning of Christmas lights and decorations. It's the realisation that we have lost the essence of Christmas by marginalising our Christian faith. I hurried about London today - to the Tower of London, of all places, to check on information for a group of Americans planning a trip there next summer, to an address in Earls Court to deliver a parcel, to the Post Office...and then to Westminster Cathedral. And there was the spirit of Christmas. An Advent wreath...an empty crib awaiting the figure of our baby Saviour, a tall evergreen alongside, scenting the air deliciously...extra rows of seats for a carol service...and long lines of chairs down the side aisle for the confession queue. And this last I joined, and the experience was beautiful and joyful. And then on to Victoria Station...but for that deserves its own Blog entry. ...nutty letters are a part of life for every journalist... but now one gets emails as well. Nasty one arrived today, full of rubbish about "Judeo-Masonic" plots. Ugh. One can cope - sort of - with the nutcases, but it's horrible when they make vile anti-Jewish comments too. ...it sounds dreary. Go straight for something exciting and worthwhile. Tell your children to wait for this film, and meanwhile if they haven't read the books, hurry to get them copies this Christmas. And hurrah for the Holy Father, talking with wisdom and common sense about children and Christmas: it's so horrible to see boys and girls robbed of their joy by being turned into obedient little consumers...here in Britain, there is something of a debate taking place about childhood and its value, and it's a debate long overdue. It seems so rare, now, to see a gaggle of children in the street giggling and laughing together and just having fun. It's even more rare to see teenagers just larking about and laughing...somehow there is an air of solemn menace stalking our common life, and cheerful merriment invites not just sneers but downright hostility. Meanwhile today the Government has announced - ugh - a Ten Year Plan for Children. Why is my immediate reaction one of horror? Is it just the Stalinist language? Or is it a realistic conviction that the thing will somehow become just another way of bashing marriage and family life? Or simply a feeling of dreariness at the realisation that it will probably mean more social workers filling in forms, and more bureacratic "initiatives" involving salaried staff talking ideological junk at the taxpayers' expense? ... with Mother, to a concert organised by the Beddington, Carshalton, and Wallington Musical Society. It was a happy evening - beautiful music, and it was in the Mallinson Room at Wallington Library, where, long years ago, I wrote my first job applications for local newspapers, after looking up the relevant addresses in Willings Press Directory. Later, as a Borough Councillor, I sat on the Committee looking after, among other things, all the local libraries, and later still wrote some books on local history (Croydon Airport) which are still on sale there - we passed a nice display of them as we arrived. It was a coincidence that brought us to the concert - Jamie's brother D. and his wife J. were both playing in it, as part of a Quartet, and contacted us, knowing this was my home patch. ...given by Anne H-P, who runs the Ladies of Charity in the diocese of Westminster...she invited me to give a talk about "Celebrating traditional feasts and seasons"... a happy evening, with lots of friends, splendid hospitality...Anne's wonderful mother, who ran the Ladies of Charity for many years, was able to be with us, and all the guests felt welcomed into a real family home...a most beautiful start to December and Advent and Christmas. This is a lovely parish. I was made so welcome, and there was such a good atmosphere - coincidentally, I had dropped in to this church when I went through Horsham on my sponsored cycle ride to Brighton, back in the summer, when I was raising money to help send young people from my local deanery to World Youth Day. So it was lovely to be back, and to meet people and be part of the parish for the evening! Whenever I speak at a Catholic meeting, sooner or later some one is bound to raise the question of what is happening in Catholic schools - children are not learning the Faith, they are confused, they don't know the basics, don't know about the Sacraments, don't go to Mass with any regularity. There is real anguish about this - people are frustrated and recognise that things are getting more muddled...it gets hard to find good practising Catholics as teachers, and schools seem to be confused about whether or not it is possible legally to insist that a teacher in a Catholic school should teach in accordance with the Church and live accordingly... even in a good a cheery meeting such as this, topics such as this get raised. Home very late: a warm, wet evening, and I sat on the train writing Christmas cards. The young prizewinners come to the House of Lords every year to recieve their prizes - Bibles, and personal book prizes, plus cheques for their schools - from Baroness Cox, who is one of our Trustees. It was a very happy day - we all met in the Central Lobby, and I gave the group a tour of Parliament: we lingered in the Great Hall, where St Thomas More was tried, and Sir Winston Churchill lay in state, and HM the Queen Mother... the prizegiving ceremony was delightful, and we had celebration cakes and proud parents took lots of pictures...afterwards we held our Annual General Meeting, reviewing how things had gone, and making plans for 2008. This is a useful organisation with real ecumenical co-operation, and much generosity and goodwill. A good comment on all of these sorts of topics comes from Melanie Phillips in the Daily Mail. How prophetic was Paul VI in Humanae Vitae. How scary our culture has become. ...and in church the first candle gleams on the Advent wreath up in the chancel, giving an ordinary weekday Mass a special feel. We will go carol-singing as a parish group, round the local streets, later in Advent, and send the money we raise to Aid to the Church in Need to help the hard-pressed Christians in Sudan. And the young people of the deanery, who are now doing all sorts of good things in association with World Youth Day, will be singing at our local railway station...they still need funds to enable them to get to Australia for this great event and if you'd like to help you can contact them through this link. ...as a taxi arrived for me while it was still dark, to whisk me up to London for a discussion on BBC Radio Ulster, about the blasphemy laws. I think it's possible to hear this on a playback system through the Internet, but haven't the least idea how this is done...help would be welcomed. London looked rather magical on a wintry Sunday morning, the Thames grey and majestic, few people about, skeleton staff at the BBC in Millbank...after the programme, I toyed with the idea of staying on in town, getting breakfast somewhere and walking up to Westminster Cathedral for High Mass, but a car was waiting and the day was beginning to look fierce, so I was taken home. Jamie was getting up and I brewed coffee and made us something to eat, then in due course set off for Mass by bike and the HEAVENS OPENED, such terrific rain that I skidded and had to shelter in a doorway. Arrived at church and peeled off soaking coat,scarf, jacket, and these dripped water into a little puddle beneath the next pew as Mass progressed...afterwards I went into the parish bookshop where I bought some really lovely things for Christmas, but I'm not telling what they are as it would spoil the secret for Mother and for various nieces etc. Incidentally, there is an excellent DVD about Pope John Paul produced by Vatican Television, which Mother and I enjoyed on Friday, much recommended. I see from the news that there is also a new one, just out, called Santo Subito and I am tempted to get that, too. ... celebratory Parish Dinner at St Bede's, Clapham Park, on the eve of the First Sunday of Advent. It was great fun, a proper sit-down dinner.... tables decorated with golden crackers...excellent food...cheerful parish priest Father Chris Basden rushing about and presiding in style. There was a raffle, and much lively talk, and it was all hugely enjoyable...I wrote the history of this parish a few years back, published as a paperback under the title One Corner of London . The church is one of several built through the generosity of an heiress, Miss Ellis, in the early days of the 20th century: it now has five Masses every Sunday plus a Saturday evening Mass, and there is a parish school and a big annual Corpus Christi procession through local streets...the room where we were eating was the basement of the large house bequeathed by Miss Ellis and now used as the presbytery and parish office - older parishioners remembered this basement as a dark and rather mysterious kitchen area but in recent years it has become the parish hall and for the Dinner was packed to capacity, uncomfortably warm but extremely jolly and full of people enjoying themselves! A happy evening. ...is a picture of the Archbishop blessing the new office of Aid to the Church in Need in Sutton a couple of days ago. All the desks and rooms, and all of us, were duly blessed with holy water while prayers were said...it was absolutely splendid. ...a Bishop seems to have spoken out about the reality of Catholic schools, and the tragic fact that in many cases they are simply not teaching the Catholic Faith. Look at this link, which is a detailed report from the Diocese of Lancaster, called Fit for Mission. 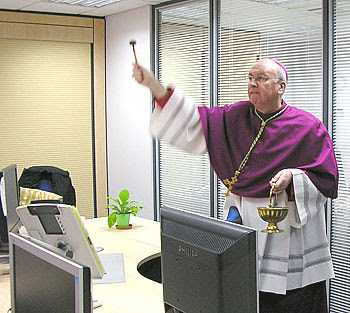 It is a rallying-call to restore Catholic schools as places of faith and commitment to the fullness of the Church's mission, right down to things like having crucifixes prominently in central locations, use of the Catechism as the foundation of RE, emphasis on weekly adoration of the Blessed Sacrament, regular confession, the Rosary, and more...it is all inspiring and encouraging. The only bleak bit comes in discussing implementation...oh dear...discussions...conferences...a Plan...and all, presumably, in the hands of the same bureaucracy that has helped to produce the mess that we have now. But if the Bishops stands firm and brings in some good people to help, he will go down in history as having done a great and decent thing in bringing about long overdue change and offering hope to new generations of the Catholic young. ...is one of the most glorious aspects of the Christian faith, so it was with great glee that I saw the headlines announcing that the Holy Father had devoted a whole new encyclical to this subject. It is, of course, a wonderful read. I downloaded it while at Mother's last night, sitting at the computer installed there by her grandson, my nephew E...extraordinary, really, that one can sit in a rainy suburb, with youths shrieking their Friday-night drunken tribal noises in the nearby High Street, and get the latest news hot from Rome, downloaded from a choice of websites and enjoyed after supper! The press today has lots of comment on the encyclical: I liked this one.